Beautiful Boy tells the story that no parent wants to consider, let alone recount in painful detail: your child’s addiction and descent into the world of substance abuse. 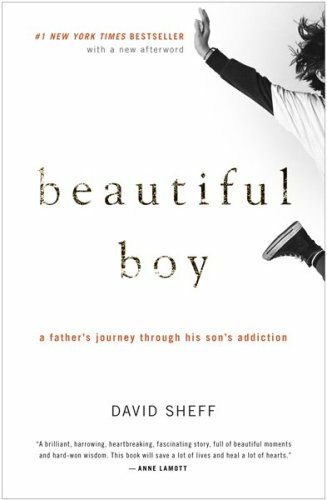 This bestseller by Scheff recounts David’s beginning life as a father to Nick, “his darling boy,” (the title’s reference to a John Lennon song of the same name) all the way up until the publication of this work in 2007, the time in-between his son’s childhood and adulthood holding an ongoing gut-wrenching battle against meth addiction. This is the work that made Scheff a household name in novel writing, although his journalism background may have made his name familiar to some before this. This is the second work of Scheff’s that I have read. The first was a non-fiction work called “Clean” that detailed what recovery means in this day and age and the options available to loved ones of an addict. The work was highly-informative and helped me to understand more about addiction in a time when I was lost in the beginings of my own loved one’s recovery efforts. Beautiful Boy is similar in nature to Clean in that it contains research and statistics on drug abuse and addiction. Beautiful Boy differs however in that its primary focus is on meth addiction, his son Nick’s drug of choice. In addition to the science of addiction and its effect on behavior and brain function, Beautiful Boy’s main purpose is to take the reader on the journey from pre-addiction, initial love affair with the substance(s), addiction and descent, and recovery. In this, what becomes clear is that the recovery process is not the final stage as the addict often relapses into the substance behavior, tries for recovery, relapses, and repeats. The story of Nick and his father’s struggle to cope with the pain and ripping apart of his world is tragically and beautifully told. The tale does often seem repetitive as Nick tries at recovery, relapses and tries and relapses again and again. But this is a common story for addicts, and is used to illustrate David’s acceptance that Nick will have to struggle with his disease of addiction all his life. The work also gets sentimental often and much, which is also understandable for the material and David’s struggle to realize his role to his son in the fight. These two elements weaken the work, while simultaneously strengthening the messages in addiction that muddle in the emotional warfare of standing beside your lying, destructive, uncontrollable addict. For those who seek to know more about the addiction process, and especially those who are struggling to support their own addict in recovery or pre-recovery, this work is a solid reference in feeling less alone and finding options to help your addict and yourself.